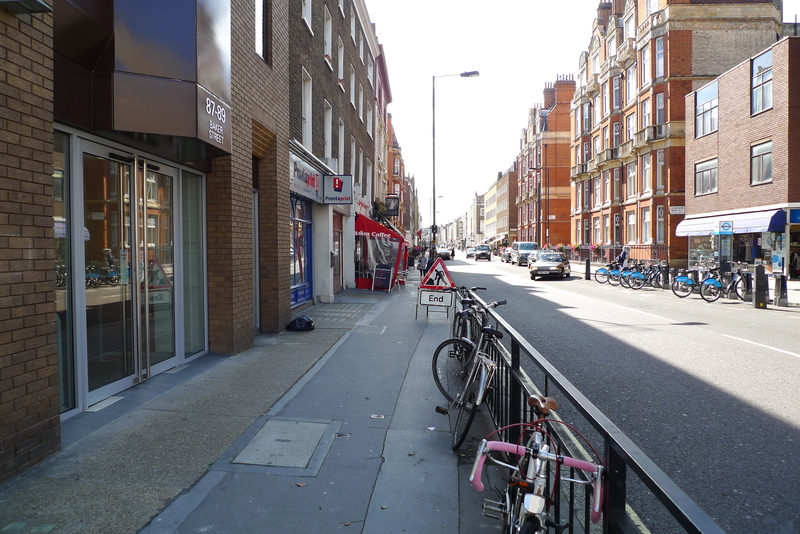 The latest draft of the Fitzrovia and East Marylebone Landscape and Public Realm Visioning Plan is now available for review and comment. Join in so that our streets and public areas provide a better space for everyone in our neighbourhood. Fitzrovia and East Marylebone are currently experiencing a great deal of change due to a number of significant redevelopment proposals, an increased residential population and a changing local economy. Whilst these developments are being proposed, the physical condition of the areas’ streets and open spaces need further attention and a strategic approach to create a more unified and attractive public realm and landscape. It is important that the neighbourhood takes advantage of good public realm design guidance that now exists. 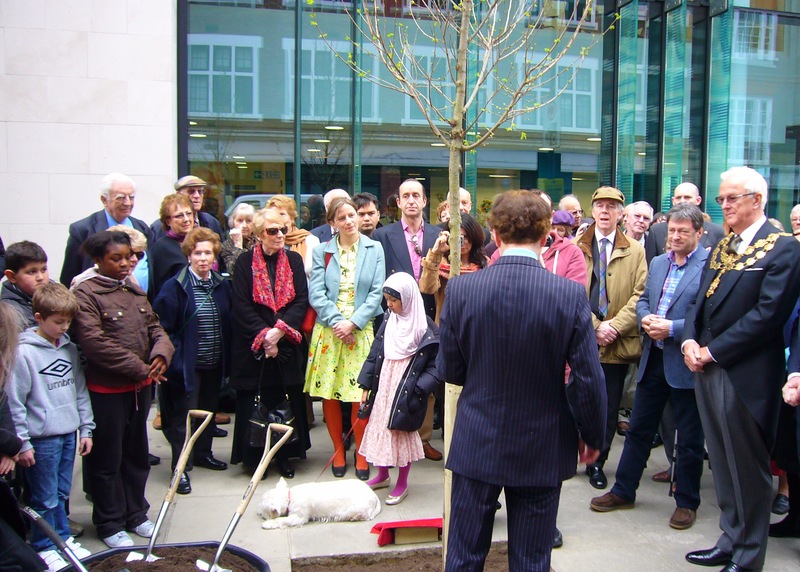 Westminster Tree Trust – the W1W Tree Planting Initiative supports tree planting in Fitzrovia to balance its contribution to the streets of Marylebone. 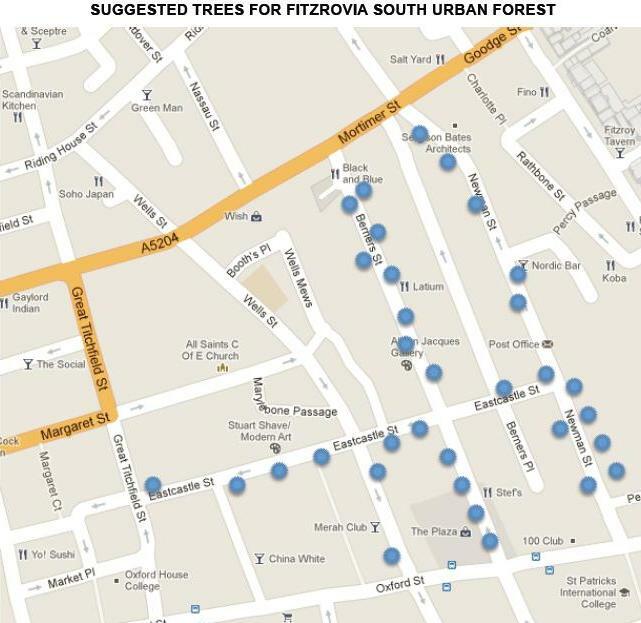 Informal advice received regarding possible tree grants for Fitzrovia stressed that it would be advantageous to show the tree project within the context of the City Council’s recently updated Public Realm Strategy. ARUP were approached as they are global leaders in Urban Design with local knowledge and as they had previous experience of drafting tree planting proposals. ARUP were gracious enough to complete this study entirely on a probono basis because they were extremely supportive of local tree planting efforts. 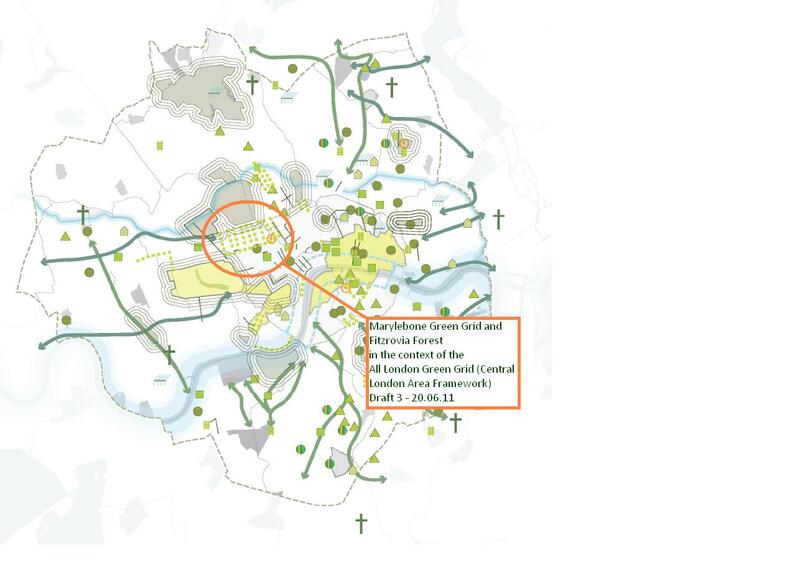 Arup surveyed the area and applied Westminster Public Realm Strategy to what they saw to create the draft consultation document. The purpose of the report is first and foremost to support tree grant applications for Westminster’s side of Fitzrovia. In order to be as inclusive as possible, the document has been put out for comment from the wider community. Subject to comments received, the document will be revised and then used to support further tree grant applications. 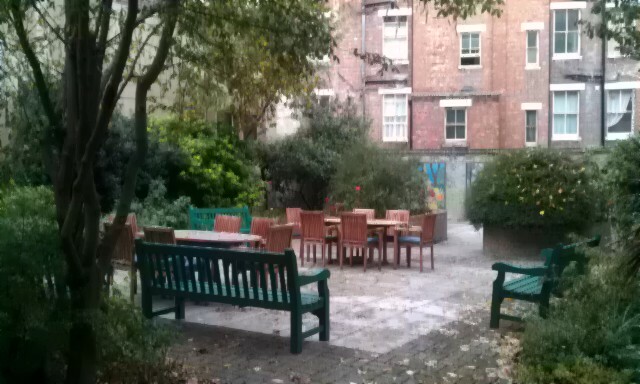 It is hoped that this may inspire the wider transformation of the public realm within the study area. On Friday 21st October, Ambassador Nicola Clase took part in a tree planting ceremony outside the Swedish Residence to mark the Embassy’s sponsorship of a tree through the Westminster Tree Trust, a charity dedicated to improving the environment in Westminster through an extensive tree planting scheme in cooperation with Westminster Council. The tree is one of over 50 chanticleer pear trees that now line the length of New Cavendish Street. 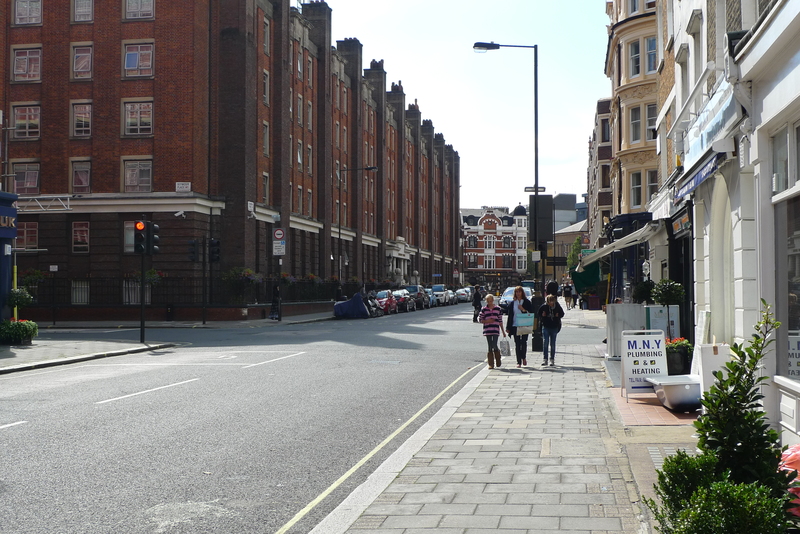 The local community again played a very enthusiastic role in the greening of this historic Marylebone Street. 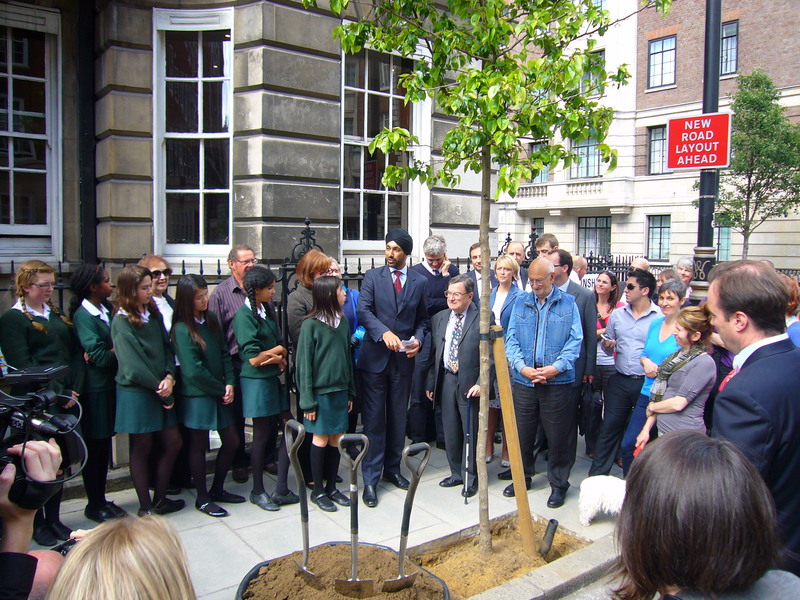 The Initiative has made a proposal to Westminster City Council to plant seventy trees on nine Marylebone Streets during 2011-2012. The resulting tree lines will complete our work on the Central Marylebone Green Grid. Fund raising from the local community has now begun in earnest in order to help achieve this goal. The streetscape of this area is mostly treeless and of a hard-built environment deprived of much open public space or greenery. Within this area there are numerous educational buildings including various nurseries, schools, colleges and university facilities along with a number of churches and a synagogue. 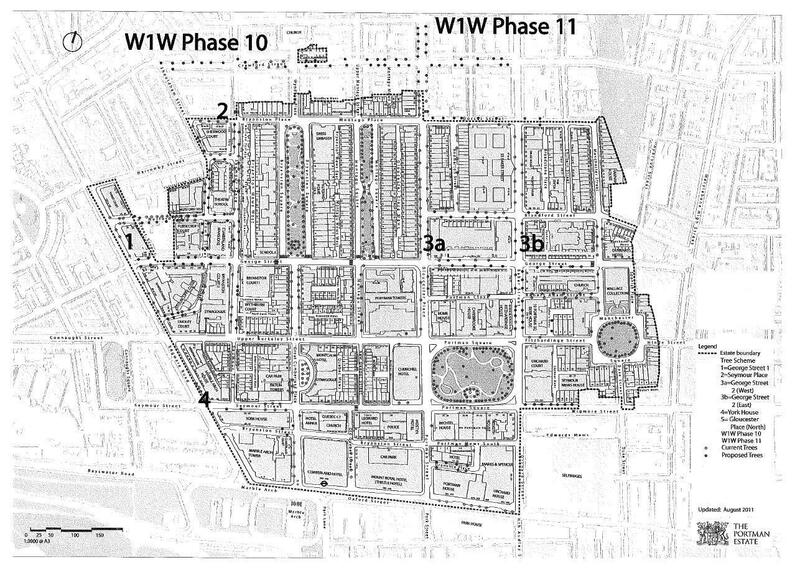 The streets to the east and north of BBC’s Broadcasting House are within this scope of this planting scheme. Furthermore, two hospitals are located on streets where plantings have been proposed. For more information to how to support this endeavour by making a donation to Phase 7 or 8 of this tree planting project, please click on the icon below. Langham Street, Gildea Street, Hallam Street (south end), Marylebone Street, Beaumont Street, Westmoreland Street, Duchess Street, Queen Anne Street, Mansfield Street. Vote for us to get a NatWest CommunityForce award of up to £6,000 to further our tree work in the Marylebone and Fitzrovia area. Our target is to plant 500 new trees here by end 2012. Over 5800 projects have been registered in the programme for possible funding. Please spread the word!! Every vote counts!! 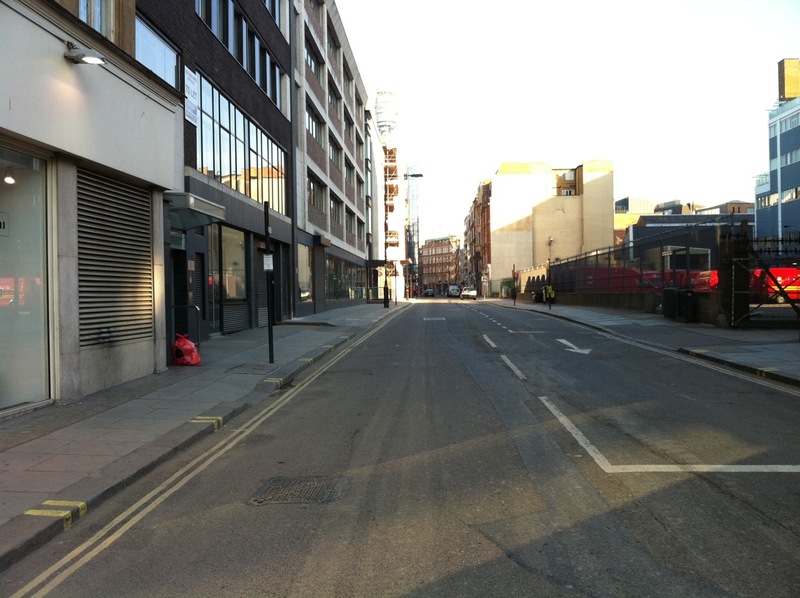 The southern side of Fitzrovia has had very little street improvement for many years. While the ORB project (Oxford Street, Regents Street and Bond Street) is improving almost all the other areas off Oxford Street, there are no public improvement works planned for these streets. Meanwhile, Crossrail and the Middlesex Hospital site, between which this area is sandwiched, involve extensive works and changes, none of which are programmed to improve the streetscape of these streets. Local businesses and residents can make this into a reality only by getting behind initiatives specifically focussed here. This local street tree project is one such initiative. The possibility of planting trees on Newman Street, Eastcastle Street, Berners Street and Wells Street is now being evaluated. It is hoped that approximately 40 trees on sites chosen to enhance the appearance of key streets and in particular of certain local long vistas (e.g. 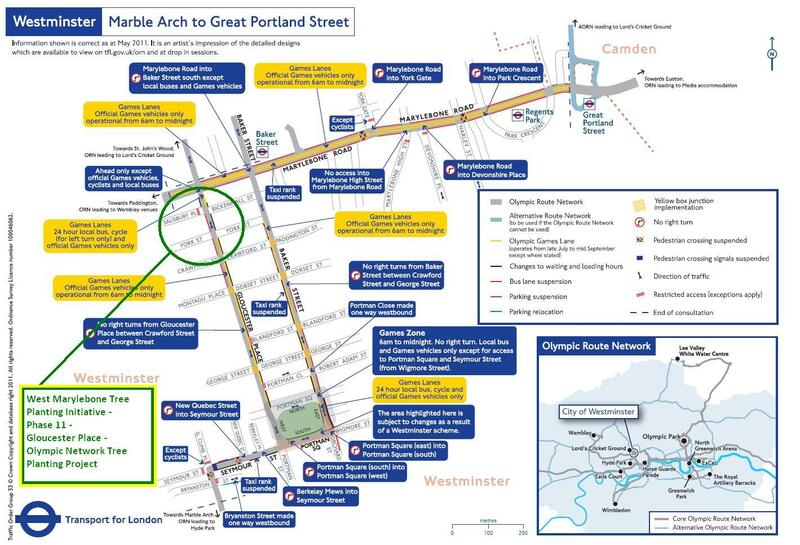 Berners Street North-South, Eastcastle Street West-East) will be possible. It is an initiative supported by local residents and businesses including those in Berners Place, Newman Street, Eastcastle Street, Berners Street. This initiative is part of the Fitzrovia Forest project which supports efforts to improve the public realm of this entire area which is bounded by Oxford Street, Euston Road, Portland Place, Cleveland Street and Rathbone Place. This proposal builds on the work previously carried out by Arup and Streettrees which was referred to as the Fitzrovia Urban Forest. 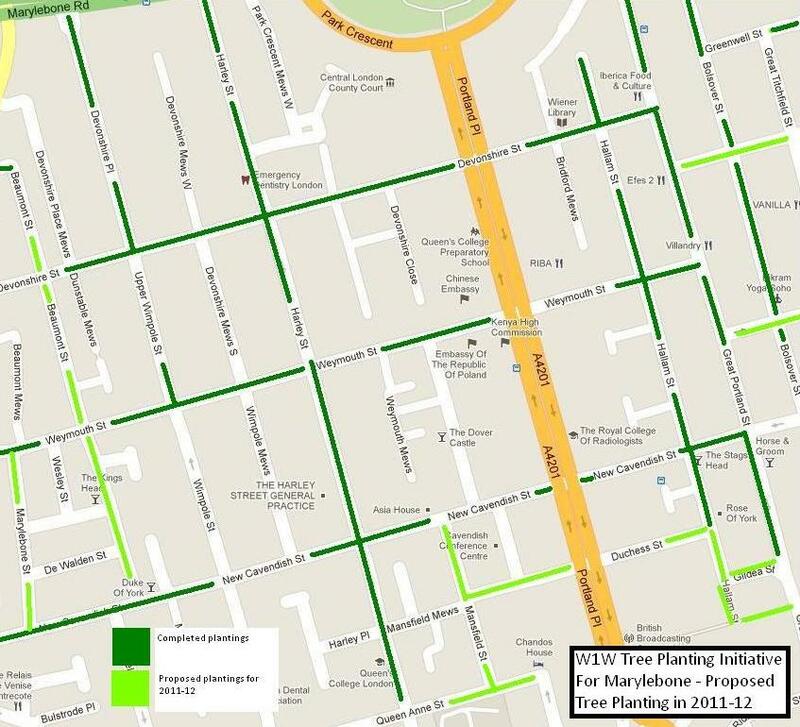 Now that East Marylebone has joined West Marylebone in starting tree planting in earnest, this scheme has a greater chance of success by being linked with schemes in neighbouring streets. Please contact w1w.trees@live.co.uk for further information. 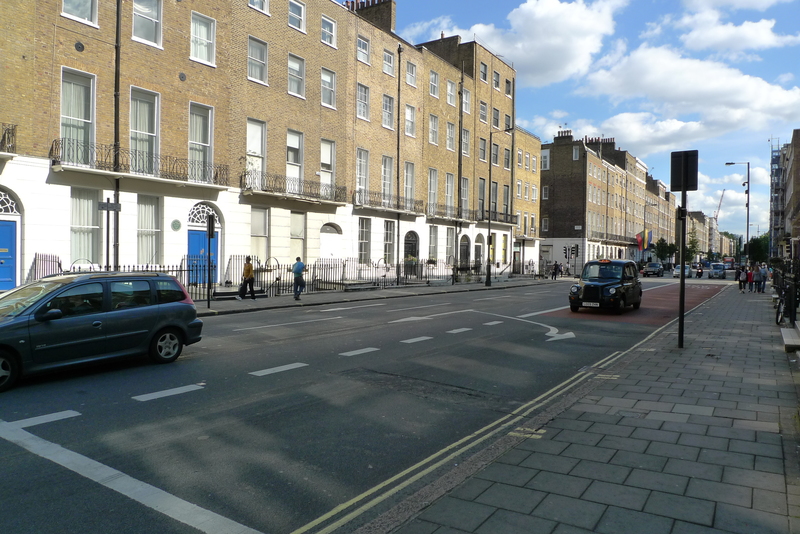 Cleveland Street is an historic Fitzrovian road which lies at the edge of London’s bustling West End. It is a high density residential, mixed usage street sitting astride the borough borders of Westminster and Camden. Local environmental pollution is a serious concern for residents. 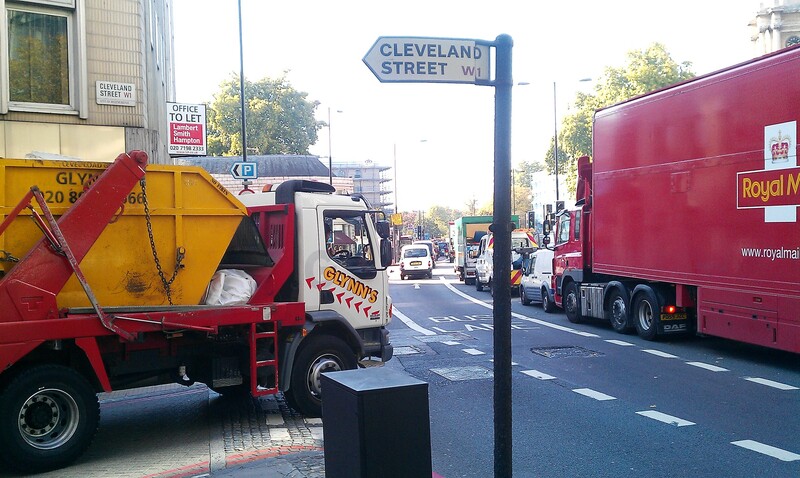 At its north end, Cleveland Street runs into Euston Road/Marylebone Road (A40 Westway) which has the notoriety of being one of the most highly polluted traffic arteries, (not only of London but of Europe!) particularly high in nitrogen dioxide, sulphur dioxide, ozone and diesel soot particles. Neighbouring Bolsover Street, which also runs into the Euston Road, was successfully tree lined in early 2011. 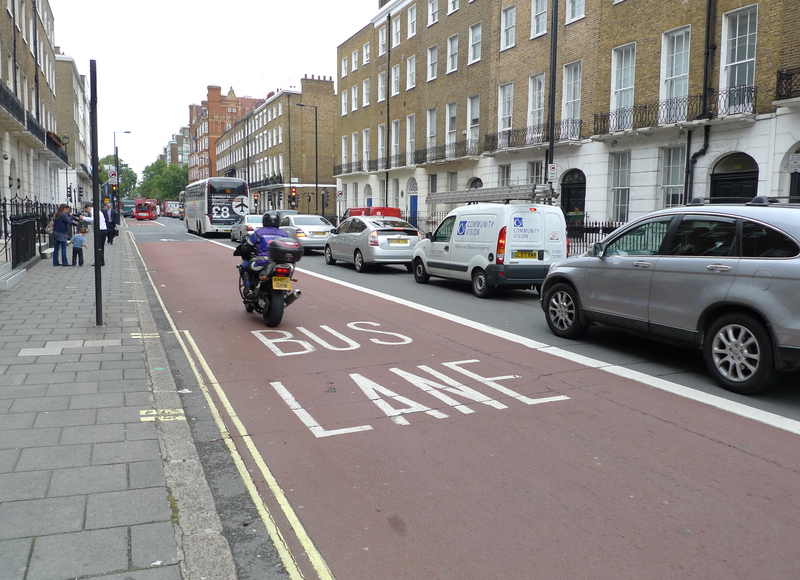 In tests carried out by the Chartered Society of Physiotherapy (CSP,) both Marylebone Road and Camden have the dubious distinction of being named as Britain’s worst “hotspots” for dangerous levels of diesel pollution. Local area 2011’s total pollution limits were reached by April – within 4 months – meaning that pollution is 3 times higher than is legally permitted! This is negatively affecting the health and even the mortality of local residents. Camden’s statistics demonstrate without question that life expectancy is significantly reduced for residents south of the Euston Road. Efforts, through this major tree planting project, are being made to mitigate the impact of the pollution and noise emanating daily from tens of thousands of vehicle exhausts mere metres away from residential homes. It is expected that tree planting on a significant scale may help shield local residents from some of the consequences of living so close to this very busy London thoroughfare, and help to improve air quality. 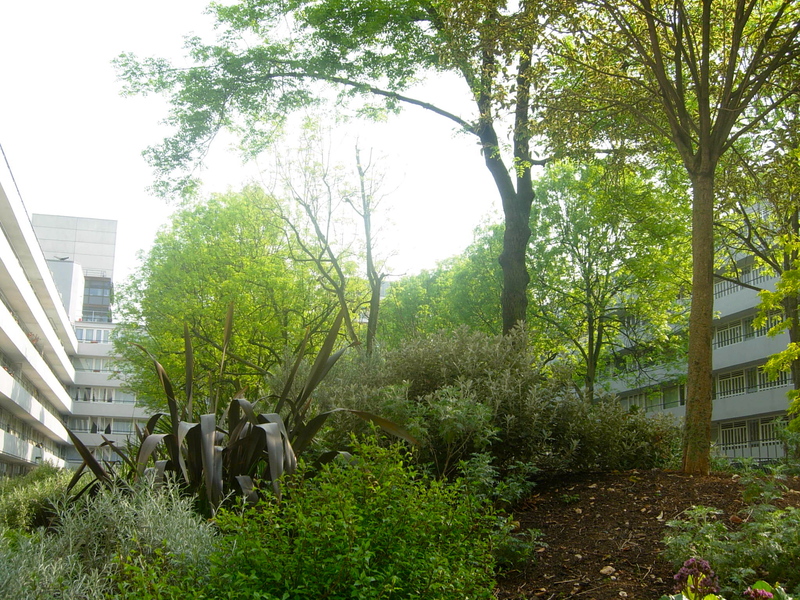 Local residents have prepared a dossier of tree site positions based on neighbourhood watch street improvement proposals (June 2007), ongoing consultations, mobilisations against early morning speeding traffic noise and a vote to campaign for more local greenery and open nature space (2011). Howard House (Cleveland Street) residents have also been active campaigning for more greenery around where they live. For more information on these endeavours please see: http://howardhouseroofgarden.blogspot.com/. If you would like to support efforts to green this section of Cleveland Street or if you need more information about this project please contact us. If you’d like to donate money towards planting a tree on our streets, just click below to download a donation form. All contributions, large or small will help us achieve our goal. 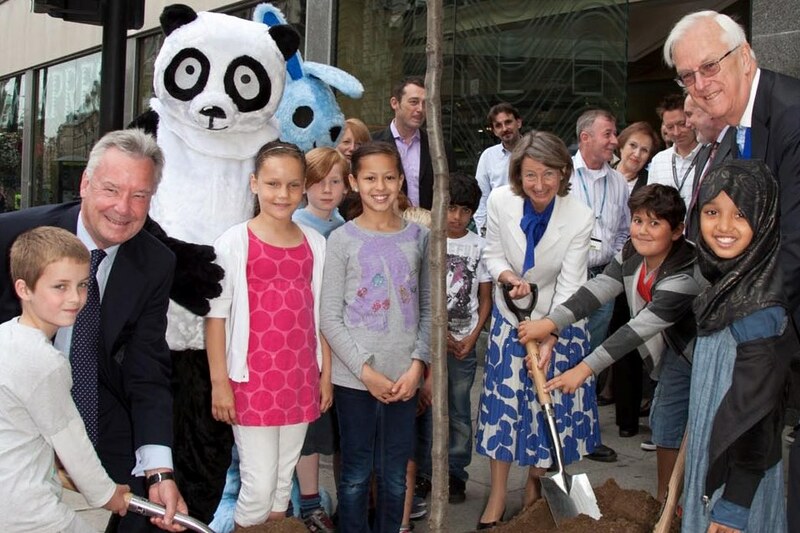 We are so pleased that Portly Panda of the Portland Hospital helped us plant our trees on Great Portland Street. Together with children from All Souls School the final trees were added to the north end of this historic street today. In association with International Students House, Pizza Express and The Portland Hospital, we marked the completion of this work with a community tree planting ceremony. The Vice Chair of the Westminster Tree Trust, Moy Scott and Councillor Harvey Marshall unveiled the plaques alongside the Executive Director Peter Anwyl from International Students House and Marco Bellisai Area Director for Pizza Express. The tree planting and unveiling of the plaques was followed by a delicious reception with tea, coffee, pastries and cake hosted by Pizza Express. We were delighted that so many from the neighbourhood could join this celebration. 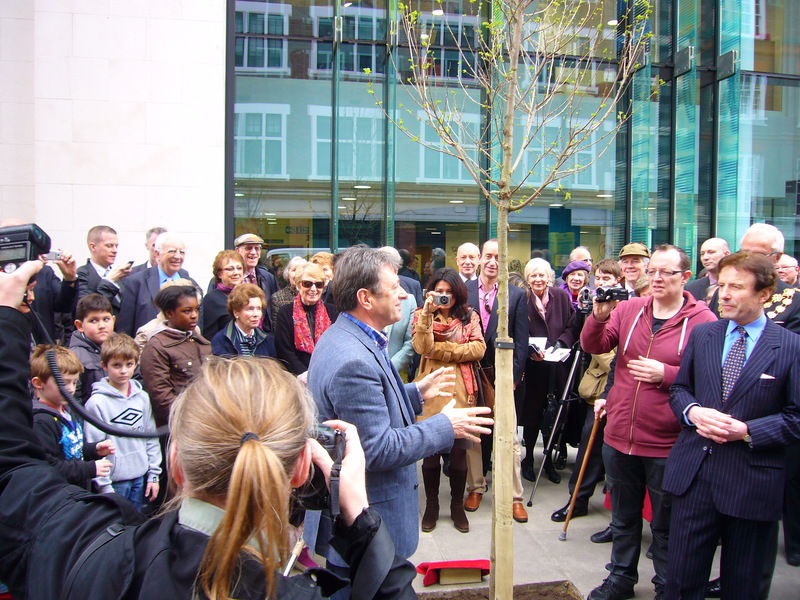 The project is a joint initiative by Westminster City Council, Westminster Tree Trust and the W1W Tree Planting Initiative, a local community organisation – residents, resident’s associations, businesses and other commercial organisations – that relies on volunteers to raise funds for the trees and planting work. 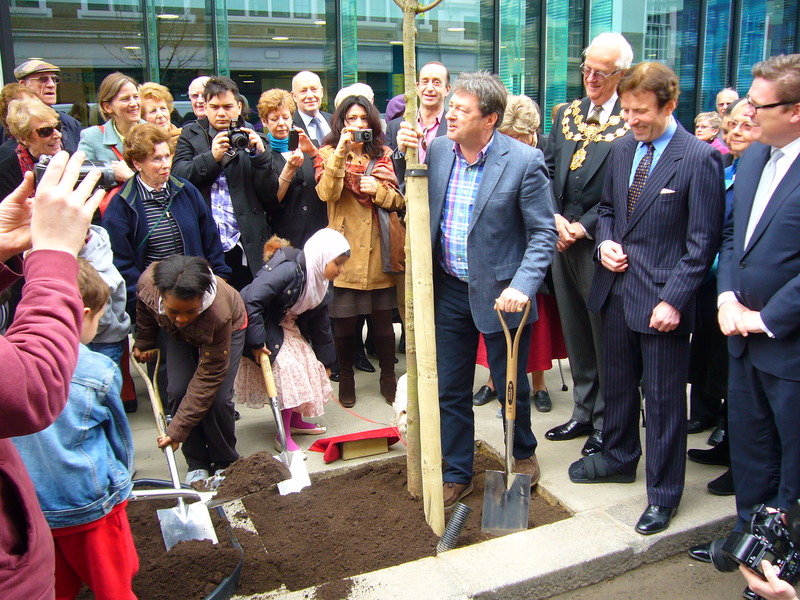 The Westminster Tree Trust has been planting trees to make London’s neighbourhoods more pleasant for over 25 years. The rain clouds left abruptly as we came to conclude our work towards greening in Devonshire Street in Marylebone today. It was a real pleasure to have Kulveer Ranger (Mayor of London Boris Johnson’s Director of Environment and Digital London), Pam Warhurst (Chair of the Forestry Commission) and City of Westminster Councillor Alan Bradley (Trustee Westminster Tree Trust) mark the occasion by planting a chanticleer pear tree – which is one of the 52 new trees that now line Devonshire Street. We are very grateful to St Marylebone School’s Green Club for joining and assisting us in planting the tree. 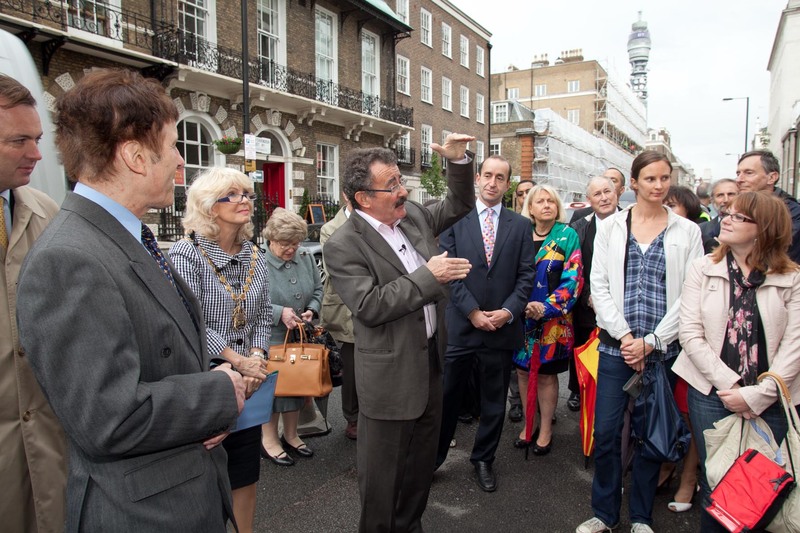 Residents from West Marylebone also joined us to celebrate the arrival of new trees on this historic street. 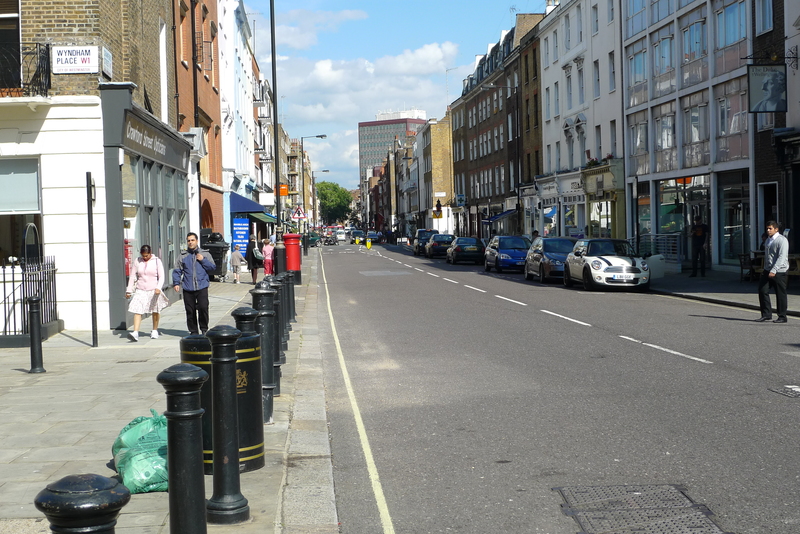 Plans have since been announced at the Marylebone Association’s Annual General Meeting about a new tree planting phase (subject to local authority survey and consent) to cover the roads west of the Marylebone High Street. The Initiative has added over 180 trees to the streets of Marylebone streets this spring – and it is set to do even better in the coming year. 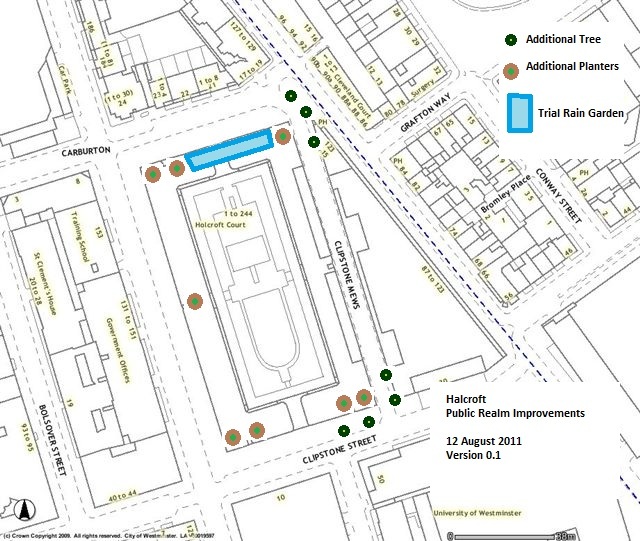 Detailed work is also ongoing to find suitable locations for trees in East Marylebone and Fitzrovia. The event also marked the launch of the Mayor of London’s RE:LEAF prospectus; a document setting out how London will increase tree canopy cover in the capital. Kulveer Ranger (Mayor of London Boris Johnson’s Director of Environment and Digital London), went on to announce a major boost for tree planting and volunteering in London – urging Londoners to sign up to Team London‘s new tree planting volunteering programme, and to provide 10,000 trees for community groups to create urban orchards, wildlife havens and help beautify London. In partnership with the Woodland Trust, the Mayor is offering 100 free tree packs for community groups to reclaim public spaces such as churches, playgrounds, or patches of unused land by planting 10,500 trees. For more information, please see www.london.gov.uk/releaf-london. A pleasant and productive reception after the planting was made possible through the generous hospitality of Iberica Restaurant for which the Initiative is most grateful. 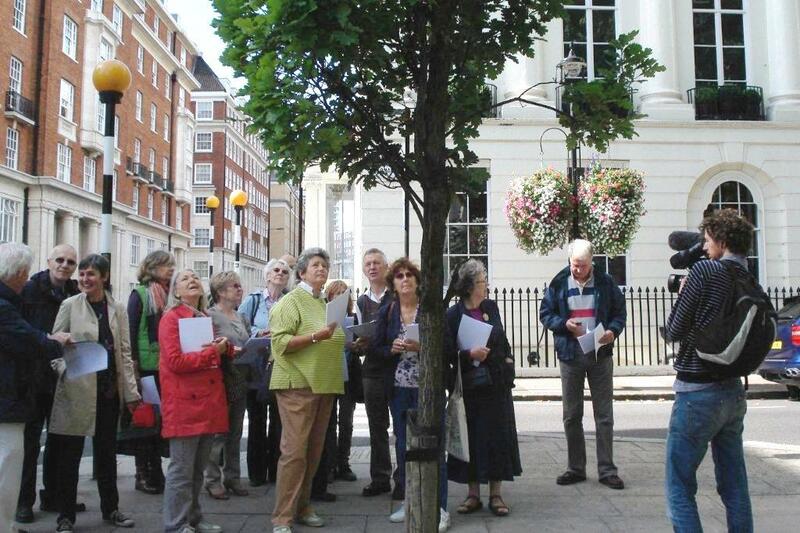 In June 2011, inspired by the forest of trees being planted on the eastern side of Marylebone High Street, a group of us decided to form the West Marylebone Tree Initiative. Our aim is to encourage tree planting to the west of the High Street. We’re part of the W1W Tree Planting Initiative, but we will focus solely on our local area which lies between Oxford Street, the Marylebone Road, Edgware Road and Marylebone High Street. Over the next few years, we hope to gradually green up the most heavily polluted areas in West Marylebone, starting with Crawford Street (Phase 10) and the remaining treeless section of Gloucester Place (Phase 11). In order to do this, we’re working closely with our local councillors, Westminster City Council, the Portman Estate, the Marylebone Association and Westminster Tree Trust. Key to our success has been the support of the Portman Estate. They’re generously helping in this work, although the streets we’re targeting are outside the Estate’s boundaries. The Estate covers the southern section of West Marylebone. Significantly, they too are undertaking a program of tree planting on the Estate. The response to planting Crawford Street has been amazing. Everyone from local residents to small businesses have got behind the idea of raising money to plant more trees along this busy street. 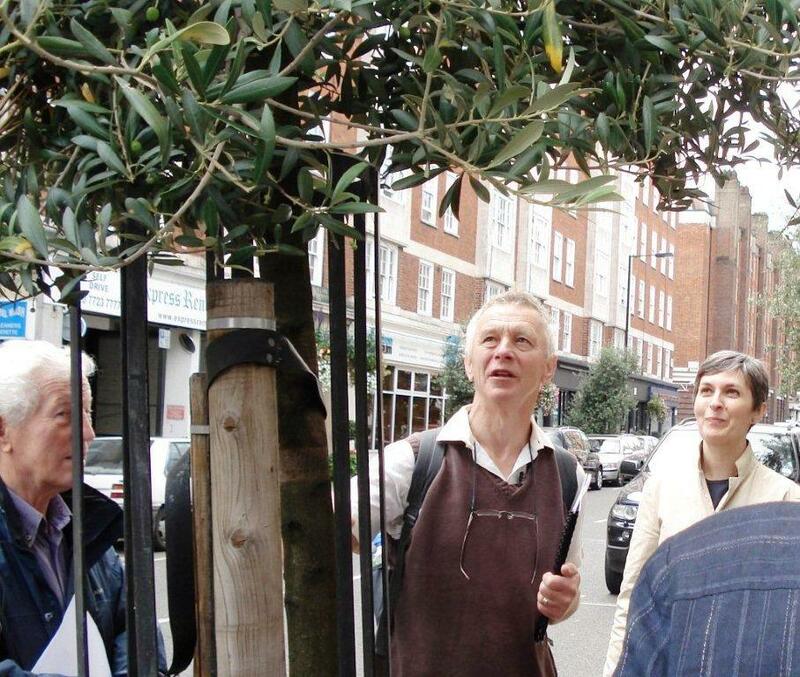 They will link up with the four olive trees planted near the junction of Seymour Place. WCC will be survey the street this autumn and up to 39 trees will be planted in the 2011-2012 planting season which runs from late autumn to early spring. If you’d like to donate money towards planting a tree in Crawford Street, just click the icon below to download a donation form. All contributions, large or small will help us achieve our goal. 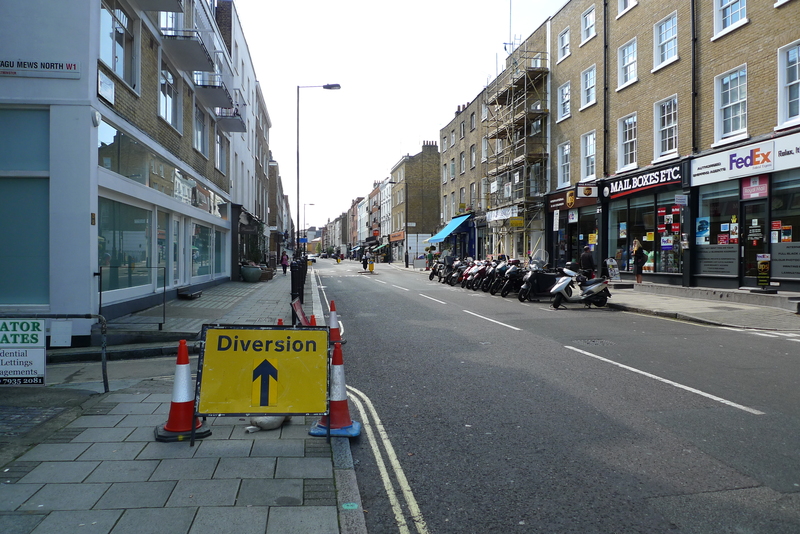 We’re targeting the last unplanted section of Gloucester Place, which runs from the junctions of Salisbury Place and Bickenhall Street to just beyond the Crawford Street junction. This unloved section of the Olympic Route is heavily polluted and currently quite unpleasant to cross. The plan is to link up the avenue of Chanticleer pear trees that have already been planted on the Northern and Southern ends of the street. WCC will survey this section of Gloucester Place in the autumn and up to 15 trees will be planted in the 2011-2012 planting season. We’re currently looking for sponsors to support our work here. If you’d like to donate money towards planting a tree in Gloucester Place, click the icon below to download a donation form. We wish to clarify that the W1W Tree Planting Initiative had no conscious part in and does not support deforestation taking place in Sarawak as could be inferred from a recent blog comment. The Initiative thanked Ridgeford Properties (RP), amongst many other sponsors, on the occasion of a tree planting on Weymouth Street with Barbara Windsor in November 2010. Mark Gazaleh, coordinator for the tree project, subsequently found himself re-quoted in a comment posted by Fitzrovia News (FN) on Sarawak Reports. Sarawak Reports maintains that RP is connected to deforestation in Sarawak. FN posted a similar allegation against RP in the context of the Weymouth Street planting. The FN allegation was subsequently retracted and an apology issued. See below. On 28 February 2011, Fitzrovia News published an article linking Ridgeford Properties Limited to Abdul Taib Mahmud, the Chief Minister of Sarawak, Malaysia. The article made a number of unfounded allegations, including claims that Ridgeford was part of a multi-billion property empire controlled by the Chief Minister of Sarawak, that this empire gained from the proceeds of illegal timber in the Malaysian State, and that Ridgeford’s Bolsover Street development was part-funded by such illegally obtained money. We now accept that these allegations are entirely without foundation, Fitzrovia News is pleased to confirm that Ridgeford Properties Limited is not funded by the Chief Minister of Sarawak, who has no business interest in or control over the company. We apologise unreservedly to Ridgeford Properties Limited, as well as its directors and staff, for the distress and damage caused by our article. As Ridgeford Properties have been a stakeholder in the area for over 16 years, it has kindly agreed to waive any claim for damages on the basis that it is a supporter of Fitzrovia News as a positive force in the community.